Look no further than your feet for one of today’s trendiest branding and promotional tools: custom floor graphics. You may know them from basketball courts. Printed decals and stickers are where the rubber meets the road — or in this case, where the vinyl meets the floor — to spur interaction and drive unique engagement between businesses and customers across industries. SpreedPro prints these custom visual pieces for a variety of indoor and outdoor applications. Vinyl floor graphics are an excellent addition for companies looking to brand and stand apart from the rest, commanding attention from the ground up. WHAT ARE CUSTOM VINYL FLOOR GRAPHICS? 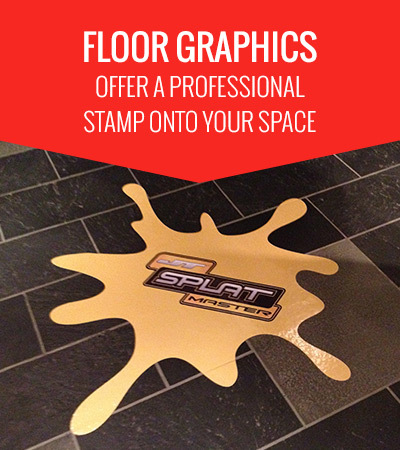 Custom floor graphics offer a professional stamp onto your space — literally. 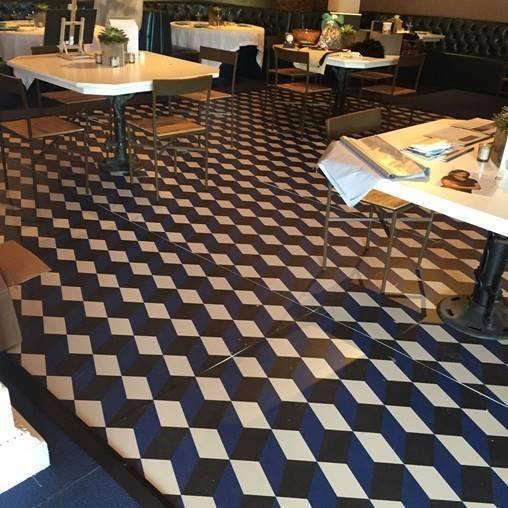 Businesses with floor graphics have gone the extra step to customize their surroundings. Yet they remain on-brand and on-mission, with floor graphics’ text and images used to display logos, showcase a mission statement, reinforce organization values or highlight other marketing and PR identities. In short, printing custom floor graphics means printing a piece of your business for that spatial “wow” factor — and reaping strategic marketing benefits along the way. 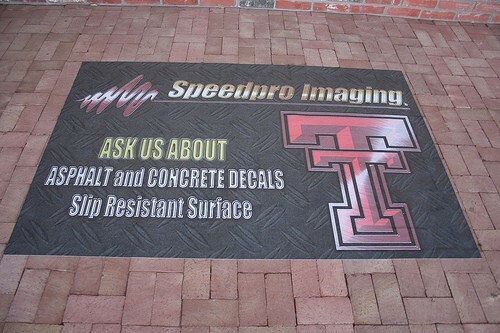 Custom vinyl floor graphics break the branding mold. With consumers more ad-saturated than ever, floor graphics are a way to capture and capitalize on the interest of an audience. Even passive eyes, like passing foot traffic or people on their smartphones, can’t miss what’s made for their gaze. Capturing attention is only the first of many business benefits outdoor and indoor floor graphics bring. Here are five more functions. Floors are too often an afterthought when it comes to branding a space — if they’re thought of at all. Their open expanses are an untapped resource to highlight marketing messages and dictate consumer behaviors in an original way that connects with real people instead of just trying to sell to them. This strategy comes wrapped in what’s known as the experiential designmovement, a design trend that merges psychology, technology and visual arts to create immersive, warm and engaging spaces. When done right, experiential design can create an environment where your brand comes to life. It will be portrayed on your walls, in your hallways, in your art and decorations — even in your restrooms. Whoever steps foot in your organization will know where they are and feel a heightened sense of connection to your space. That connection drives successful branding. It’s here that floor decals and experiential branding align. Rather than inundating clients and visitors with advertisements and marketing messages they’re already familiar with, vinyl floor graphics build a fresh ambiance. They amplify a room’s professional look and feel while also showing off your branded personality — and they break from convention while doing so. Steer traffic and conduct organic crowd control by printing custom signage directly onto your floors. In retail stores, traffic control keeps lanes clear and mitigates chokepoints at checkout and in popular departments. In supermarkets, floor decals can serve as aisle labels, complementing or even replacing hanging signs and assisting in crowd movement. In malls and outlets, outdoor floor graphics identify your storefront and help it stand out from the rest, drawing both eyes and feet. Stores of any kind with more than one door can use printed floor decals to indicate proper entryways. Guests won’t be left guessing which entryway is right or why a door is locked, which can inhibit their sense of welcome. Labeled areas are smart for crowd control, and in some industries, it’s even a matter of compliance. Consider designated equipment lanes in warehouses, where pallet jacks, compact loaders, golf carts and more can navigate safely down narrow stocked aisles. Think of areas that indicate protective gear storage and mandatory sanitation stations. Custom floor decals achieve all this without sacrificing a quality appearance. Blending form with function, they make a keen statement about the professionalism behind your business. Custom floor graphics can be used as temporary or permanent signage, which makes them ideal candidates as sales vehicles, promoting goods and services for a select period or proclaiming continual deals. In-store specials remain as popular as ever. Customers across demographics repeatedly cite how important thrift is in their shopping decisions. Price discounts and free samples are the most common in-store promotions influencing purchases, with custom floor graphics providing an ideal template to guide customers to sampling areas as well as promote items on sale. Boosting your in-store specials is an art form as well as an imperative. With over half of people’s purchasing decisions made in-store, businesses must leverage marketing materials that will connect, convert and close sales in real-time to remain competitive. This process requires effective messaging material design — exactly what you get with custom vinyl floor decals. Floors are a blank business canvas. Give your business an “it” factor using a medium that’s already right there, in place and available for adornment. Custom floor decals amplify the aesthetics of your space. They can be used as decorative elements, ornaments, colorful visuals or room accents. SpeedPro has even printed large-format floor decals that look and act like custom flooring itself, adding a creative, bold and eye-catching twist to the normal wooded or tiled commercial space. These aesthetic touches can be your business’ statement piece. Organizations using indoor floor graphics appear both professional and fun. They aren’t satisfied with conventional appearances or long-held expectations of what a store, restaurant, office, hotel or anything in between should like like. Plus, floor decals sit at a price that makes them far more cost-effective than floor renovations — another benefit for businesses looking to revamp their space. Floor decals and graphics make the floor speak for you. They support and reinforce your brand, convey relevant information, embellish your space and captivate attention. They can also relay other details about your organization — details that otherwise wouldn’t meet the eye. Communicate all this information seamlessly and organically. As a result, everyone from passive visitors to return customers will connect further with your brand, feeling a part of its enduring success. 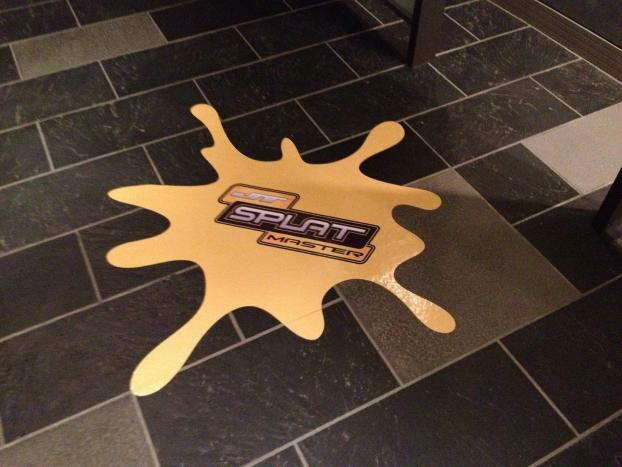 Vinyl floor graphics provide a creative marketing tool with serious conversion power. Studies from the International Journal of Business and Management Invention found that floor ads boosted sales by 30 percent for control-group companies utilizing them. Another piece from Point of Purchase Advertising International’s Mass Merchant Study identified point-of-sale displays as increasing sales by 1.4 times. The most common variable to that sales-boosting success? Rotating displays to keep pictures and information fresh — precisely what floor point-of-sale promotions do. People on their smartphones: The average American will use their smartphones 52 times in a single day. That translates to 3.3 hours staring down at a handheld screen — down being the operative word. Positioning logos, marketing messages and company information directly in that line of sight is an unbeatable marketing strategy. People in lines: Bright, bold and visually arresting, floor graphics are an MVP in the lineup of influential point-of-sale conversion tactics detailed above. And when are eyes primed for bright and bold stimulus? When they’re waiting in line. Whether in-house at your own register or in public queues — such as those at bus stops and subway stations — indoor and outdoor floor graphics make for interesting visual material for those waiting in line. People in a hurry: Most sales signs and advertisements hang at or above eye-level. This placement makes sense for intentional shoppers and in-store browsers, but what about those not in an active shopping mindset? With unexpected placement, vinyl floor decals can catch and hold the attention of those in a hurry — many of whom are likely already looking down. Research indicates that those walking in a rush focus more on their footing, an unconscious reaction our brain initiates to ensure stability given increased walking speeds. 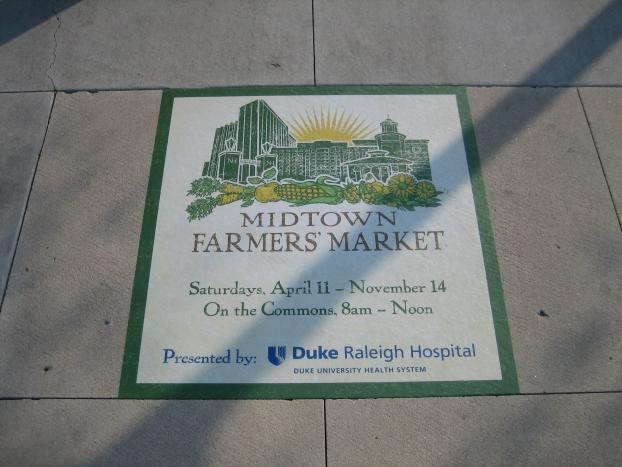 You can take advantage of this natural occurrence through strategically set floor graphics. WHERE CAN I PLACE CUSTOM VINYL FLOOR DECALS AND GRAPHICS? 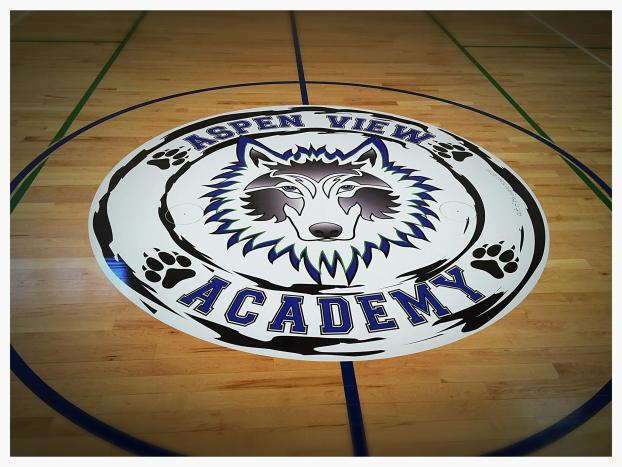 There are a few “ground rules” for placing and sustaining vinyl floor graphics. It’s essential to always prepare the floor before installation, for one, which means cleaning the entire application site to remove dust, dirt and oils, then drying it thoroughly to ensure the decal’s adhesive backing can adequately stick. Depending on your floor type, there may be additional steps and preparations to take into account. Consider installation across the following floor types and application areas common for custom decals and how you can go about maximizing the designs’ lifespans. Outdoor decals must be tough and durable. They require patient application in order for text and images to remain intact, protected from the increased elements their outdoor setting exposes them to. Select slip and skid-resistant laminates: This step is especially important if you’re laying your decal in an area bound to experience foot traffic, such as doorways, sidewalk, gateways or parking lots. Opt for extra matte protection and the strongest adhesive: An extra matte laminate layer bolsters your outdoor floor graphic’s strength, screening against UV rays, ice and rain, while the strong adhesive keeps the graphic in place. Look out for moisture and condensation weak spots: Condensation builds up in exterior nooks, cracks and holes. Fill and smooth any of these that you find, then leave at least 24 hours for filler material to dry and solidify before placing your decals. Bear in mind temperature changes: Contemporary sidewalks and driveways made from cement or asphalt come poured with small but important temperature-fluctuating relief channels, which help keep their surfaces from cracking or shifting when temperatures change. Be careful when placing your custom decals outside not to obstruct or seal off these features. Keeping the installation area clean and dry beforehand is as essential indoors as it is out. With indoor applications, you’ll also want to note any treatments the application site receives, such as waxing and vacuuming. Hold off on surface treatments for 24 to 48 hours before laying your indoor images. For vinyl and tile, place your floor decals no less than half an inch from tile edges and grout lines. Like cracks in cement or asphalt, these spaces can trap air bubbles and cause premature peeling. For wood or wood laminate, keep an eye out for floor end joints. Even shallow ones can make custom floor decals pucker and appear bumpy and irregular. Use a squeegee when applying decals. Doing so will provide smoother, more even pressure and prevent air pockets from forming, compared to pressing manually with your hands. Give the newly applied decal eight to 24 hours to set, depending on size and scale. 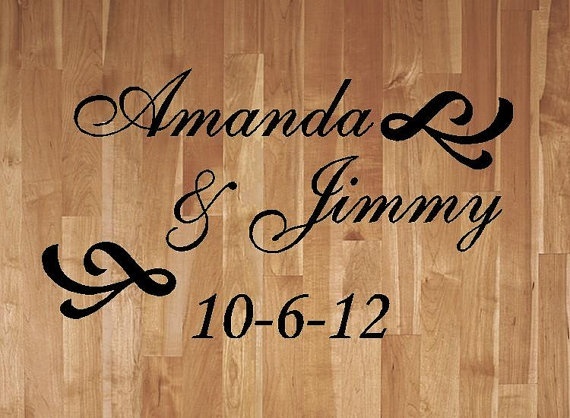 Afterward, you can treat your floor graphics and messages like any other part of the flooring. Your business, brand and vision matter — make your messages count just as much. SpeedPro’s national network is made up of visual communications studios adept at handling indoor and outdoor custom vinyl graphics. When you select us as your printing partner, you’ll gain access to insights and expertise across the entire floor graphics order process, plus your own representative to field questions and handle any decal-related concerns.